We had 6 hens and a rooster in a finch aviary for a couple of years, and had quotes from many people to build a proper chookhouse, but we weren't happy with any of the plans submitted, until we discovered Yummy Gardens on the internet. Greg came out and did a measure and quote, and while it sounded expensive to our friends, we were happy with it because his plans exceeded our expectations. The chookhouse and run was completed in three days by Greg and his assistant, and we were absolutely delighted with it, as were the chooks. They went from one or two eggs a day to four and even five eggs most days. Our friends and neighbours are blown away when they see the size of it and we had an official opening and cocktail party to celebrate. 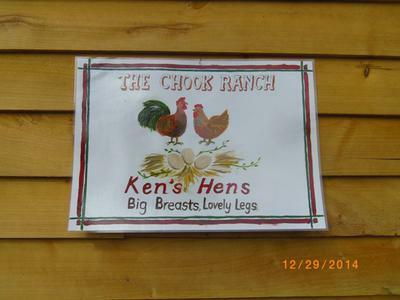 We've called it The Chook Ranch and I painted a sign to put up on it. We wanted a few minor alterations to the structure, and Greg came out and did those for us, no problems at all. We would recommend him to anybody who wants a custom built chook pen.